The 24-70mm equivalent f/1.8-2.8 lens remains the same, but battery life has decreased to 280 shots (down from 320 shots in version III). Widens its angle of view to 24mm (with brightest aperture f/1.8). Adds a pop-up SVGA OLED electronic viewfinder with 1.44M dots! Tilts its 3″ LCD further to a full 180 degrees. Adds a Nuetral Density (ND) filter, great for allowing slow shutter speeds (such as to blur moving water) in bright sunlight. Compared to Sony RX100 III, the rival Canon PowerShot G7X camera has no viewfinder, poor battery life, unreliable focus and poor manual focus magnification. In its favor, Canon G7X has brighter lens from 24-50mm equiv (up to 2/3 stop better), longer zoom 24-100mm equiv (versus 24-70mm), touchscreen and LCD that flips 180-degrees for selfies, in a body having the same weight, size and sensor, capturing similar image quality in studio comparisons. The earlier Sony RX100 camera version II (2013, 10 oz) has a tilting LCD, one stop better ISO sensitivity than version I, and a flash mount. Sony RX100 camera version I (2012) weighs 8.5 oz and has a 28-100mm equivalent lens with f/1.8-4.9 brightest aperture from wide to tele, with close focus/macro distance 5 cm. It fits nicely into Tamrac Digital 1 Photo Bag with extra Wasabi Power NPBX1 batteries. Look for a great value on a used Sony RX100 version 1 (model DSCRX100/B) at Amazon (worth the price premium over a used Canon S110, both introduced in 2012). 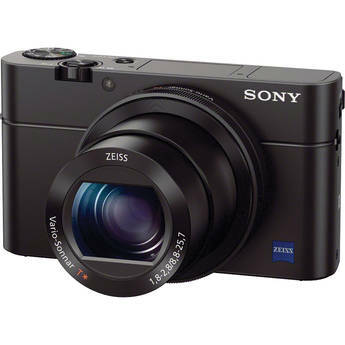 The world’s best pocket-sized camera of 2012, Sony RX100 camera version 1 (8.5 oz, model DSCRX100/B), packs the largest sensor (1-inch Type) ever designed into such a small body. Its high image quality and autofocus speed beat any other zoom camera under 16 ounces! Both RX100 versions I and II have 3.6x optical zoom (28–100mm equiv), with brightest aperture f/1.8 at wide angle zoom and f/4.9 at telephoto. But as expected, images will be sharpest when shot at a few stops down, around f/4 to f/5.6. A trip to Italy in summer 2013 reconfirmed my excitement about the RX100: its 20-megapixel sensor can resolve more detail than my former 12mp Nikon D5000 DSLR camera using kit lens at ISO 200 to 400. 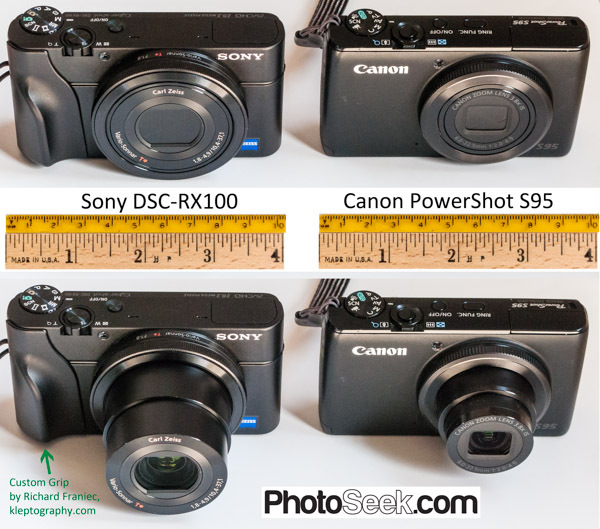 Pocket-sized wonders: Compare camera lens and size of Sony DSC-RX100 version I (left) versus Canon PowerShot S95. To better grasp the slippery body of a Sony RX100 (and other compact cameras), order a Custom Grip from Richard Franiec (shown above) or Sony AG-R2 attachment grip . Protect your RX100 in a Tamrac Digital 1 Photo Bag, with room for extra Wasabi Power NPBX1 batteries. The unusually large 1-inch Type sensor inside a Sony RX100 is 2.8 times bigger in surface area than a 1/1.7-inch Type sensor in a Canon S110, S95, or G series camera. (Compare sensor sizes in separate article.) The larger-diameter RX100 lens gathers more light onto its sensor than any other pocketable zoom camera, capturing superior quality. To beat the image resolution recorded by an 8.5-oz Sony RX100, competitors require increasing camera weight to 16 ounces or more! For example: a 16-oz Sony Alpha NEX-6 (16mp) with 16-50mm Retractable Zoom lens beats RX100’s quality above ISO 800 (and adds a fantastic viewfinder with 2,359,296 dots). Surprisingly, studio tests show that a little 8.5-ounce Sony RX100 can beat or equal image quality from a 29-ounce Nikon D5000 DSLR with kit lens (12mp APS-C sensor, 2009) from ISO 200 up to 1600. Image quality and resolution is judged not by megapixel (mp) count but instead by comparing standardized studio test views at 100% pixel enlargement and checking resolvable lines per picture height (LPH). 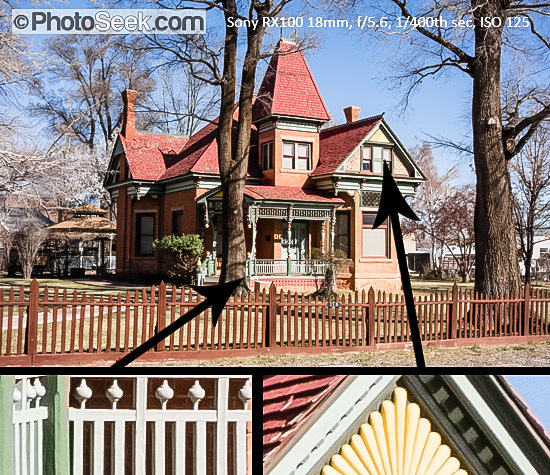 100% pixel enlargements from the 1895 Heritage House (Kanab, Utah) illustrate the sharp resolution of a Sony Cyber-shot DSC-RX100 compact camera (f/5.6, 1/400th sec, ISO 125, zoomed to 18mm, which is “48mm equivalent”). As expected, images will be sharpest when shot at a few stops down from brightest aperture, best around f/4 to f/5.6. Beyond that, due to physics, higher f-stops will soften images with diffraction, especially at f/11, the RX100’s smallest lens opening. 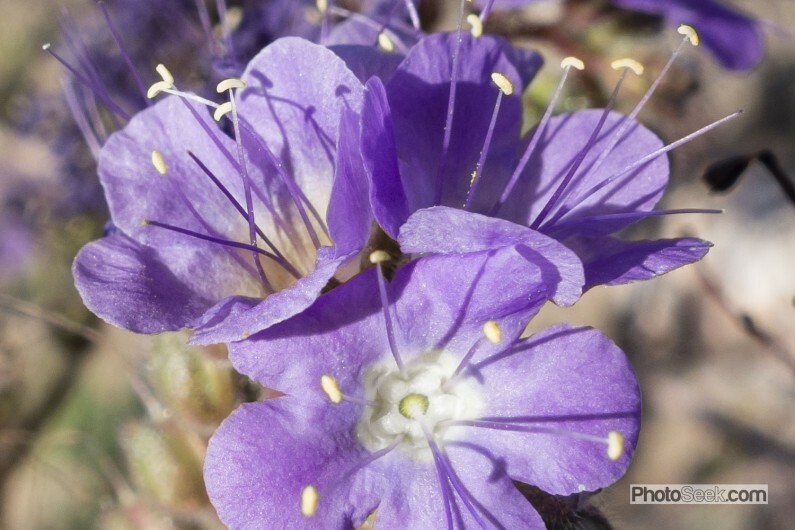 For telephoto subjects, an RX100’s moderate 3.6x zoom easily beats the quality of cropping images from a fixed-lens (non-zoom) camera in this size class. The RX100 captures full HD 1080/60p video with stereo sound. Its aluminum body pops up an effective flash. Record stills using raw, JPEG, or both. Its unusually fast autofocus and 10 frames per second burst mode capture action much easier than previous pocket cameras. My test shots on a Sony RX100 (20mp) were more than 50% sharper than a Canon S95 (10mp) throughout the zoom range, from close focus to infinity. Note that in studio comparisons, Canon S110 (12 mp) is less than 10% sharper than Canon S95. Cropping images from my RX100 beats the real resolution of a bulkier Canon PowerShot G9 from wide angle through 150mm equivalent. For travel portability with top image quality, a Sony RX100 version I camera clearly beats my former Canon PowerShot S95 (2010) and rivals my DSLR camera quality of just 3 years ago. Get a great value on a used Sony RX100 version 1 (model DSCRX100/B) at Amazon (around $200 as of May 2015, same price as a used Canon S110, both introduced in 2012). Support Tom’s work — buy anything after clicking any Amazon.com product links here on PhotoSeek.com. – a used Sony RX100 version I is $200, a much better value than a used Canon S110 also $200 (both introduced in 2012). – a used Sony RX100 version II is $300, a much better value than a used Canon S120, also $300 (both introduced in Fall 2013). – a used Sony RX100 version III is $600, or new is $800. With that fast lens, the Sony DSC-RX100 might compete with the NEX for some uses. Do you know the f-stop at 35mm and 50mm focal lengths please? Yes, good question. The brightest aperture for Sony DSC-RX100 version I at 36mm (equivalent, optically zoomed to 1.3x) is f/2.8 and for 50mm (equiv, zoomed to 1.8x) is f/3.2. Note that those f/stops have a physically smaller hole and thus greater depth of field than the respective f/stops on a larger-sensor camera such as a NEX-6 or NEX-7 (with APS-C sensor). In bright light, shooting between ISO 200 and 800, a 20mp Sony DSC-RX100 with 28-100mm “equivalent” zoom competes surprisingly well against a camera twice its weight, such as a Sony Alpha NEX-6 (16mp) with 16-50mm (24-75mm equiv) retractable zoom lens.